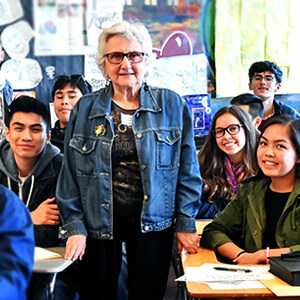 The Next Chapter enables high school youth to develop profound connections with Holocaust survivors. By participating in the program, students build a special community of social responsibility and genocide awareness. Students in the 2017-2018 Next Chapter cohorts. The program is offered both in San Francisco and on the Peninsula. 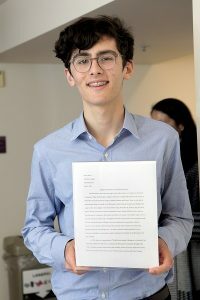 We are so proud of the hard work and meaningful reflection that each student put into their project during the 2017-2018 program. Here are a few examples of personal projects by this year’s Next Chapter students. 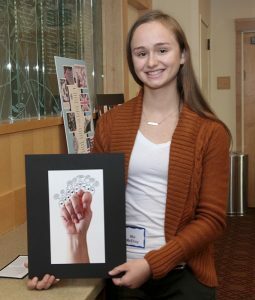 “When I was thinking about what I wanted to make for my personal project, I knew I wanted something that will honor the Holocaust survivors in my family. I also knew that I wanted to incorporate two things that I love, and make up a big part of my life: Violin and Laser Design. Both of my great grandparents are survivors. My great grandmother, Sarah Raiss was born in the Czech Republic, and moved to Hungary when the war started. Her parents put her in a nunnery and that is how she survived. One of the few good memories she has from her time in Hungary is the music, and in particularly the song Czardas, by a Hungarian composer. My grandmother always talks about how she loves his music and how she loves to hear me play. So I thought that it would be perfect to record myself playing that piece to honor her and her amazing story. For my great grandfather, Dov, I decided to make something that I actually heard from one of the amazing survivors we were lucky to hear from, Jeanette. Dov was the sole survivor from his side of the family, so when I heard that Jeanette made a “Stolperstein” or “stumble stone” to honor her late family members, I thought that that was perfect. I created my own version of a stumble stone. I had two names put on it; (the names of Dov’s parents). 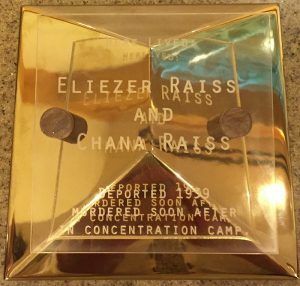 Since I did not have an actual gold brick, I decided to take a golden tile, and I laser cut and acrylic square with the engraved details on it, and mounted that on the tile. 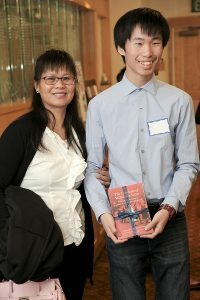 Edwin and his mother at the graduation ceremony. A place that hungers for fear. Let the future remember me. Mia with one of her photos.